Today's theme for Review Appreciation Day at The Cait Files is all things HARRY POTTER. 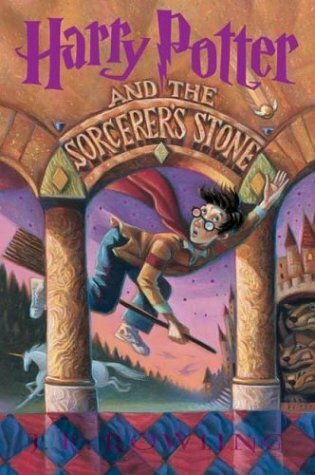 When Harry Potter and the Sorcerer's Stone first hit the shelves, I was holed up in my dorm room at North Georgia College surounded by textbooks. I often felt like WWIII could break out and I would be none the wiser (well, that's not exactly true since I went to military college and I'm pretty sure the campus would change drastically if WWIII broke out). But you get the picture, that I often felt isolated from current events, so I was complete unaware of this phenomenon hitting bookstore shelves. I don't think I even heard anything about Harry Potter until a few years after I graduated college. Now, we are told that it will all end on July 15, when the 8th and final movie hits the big screen. Though, it won't be the last we hear about Harry Potter now J. K. Rowling has decided to publish the ebook version. But in honor of the last of the story being told (you have to admit that the movies at times seem like a different story than the books). I am sharing my Potter experience. I did not take an interest in Harry Potter until almost 2005. I joined a movie club and received 10 free movies. I decided that I would see what all the buzz was about and ordered the first 3 movies. I was hooked with the first movie. I immediately searched out people I knew who I could borrow the books from. I really liked the movie version of Prisoner of Azkaban when I first watched it. After reading the book, I decided it was my favorite one. 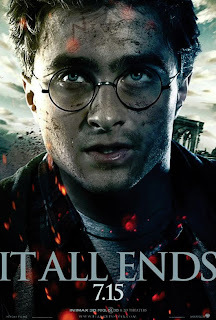 There seemed to be more emotional development in this one: a connection to his parents, in particular his father (his patronus) as well as the bonding between Harry, Hermione and Ron. I have to admit that when I watched the movie I was confused by the appearance of the stag at the end of the movie. From the movie, you do not learn that significance of the patronus form, which you do get in the book. The first movie I saw in the theater was Harry Potter and the Goblet of Fire . What stuck with me most, though, was not to read the book immediately before seeing the movie. I kept trying to mesh what I was seeing on the screen with what I knew took place in the book. Which with HP 4 having a large portion of the book left out of the movie, it was difficult and I was confused most of the movie. I never read any of the books on release day as I always borrowed a copy. I remember in the lab, we were banned from speaking of Half Blood Prince until everyone had read the book (there were several people with copies so it only took a few weeks for everyone to read it, but during that time there were many whispered conversations as each finished the book). Knowing that I would have to wait for the book, I would start re-reading just weeks before the release and usually from the library, which slowed down how quickly I could read through them (the waiting list is always long). I managed to attend the midnight release of Deathly Hallows at Barnes and Noble. It was kind of boring, truth be told. But I had fun hanging out with my friends Amanda and Barry. For a few of the movie releases, I hosted a movie marathon. I think I hosted it for the 4th, 5th, and 6th movies. The first two we did actually watch all the previous movies in 1 day, starting about 1 pm and ending close to midnight. For the last party I split it between Friday and Saturday nights, but the parties were not as well attended and I didn't host it for the 7th release. I decorated my house for one of the movie marathons and several people brought Harry Potter foods. We tried treacle and pumpkin cookies - this was before the The Unofficial Harry Potter Cookbook (which I have the free Christmas cook book and saw that there was another section available for free recently for my Nook). I was able to pick up copies of Chamber of Secrets , Half Blood Prince , and Deathly Hallows at my library's Fall Festival sales over the years. After the 4th movie, I started re-reading the book after seeing the movie, often as soon as I got home. I debated whether to re-read Deathly Hallows following the release of part 1 or waiting for part 2. I decided to wait until part 2. I went to a midnight showing for Order of the Phoenix . Like the midnight release of Deathly Hallows, I'm glad I experienced it, but do not wish to do it again. We had a large group and trying to find seats together put us in the 3rd row. I was so tired; I remember feeling owlish. And the movie was a blur (whether because of the close range or tiredness, I don't know). I left the movie hating it. Subsequent viewings have improved my opinion of it. As I write this post I'm continuing my personal movie marathon (I'm reduced to watching one movie a night) with Chamber of Secrets (I got behind because the plumber came Tuesday night). I won't be going to the midnight showing; I'm not even going on opening day. I'm waiting until Sunday to enjoy the movie with friends, because I think that is truly what has made Harry Potter a special experience. I think more so than any other book Harry Potter has brought people together with their common love of this fantastic fantasy series. Harry Potter opened me up to a new genre (prior to Harry Potter, I don't think I ever voluntarily read a fantasy novel). It also exposed me to online communities - I was a regular visitor of MuggleNet.com, while I stuck mostly to the news sections I did read a bit of the writings/stories that were submitted. I also loved their weekly caption contest, though I never participated. So I bid farewell to an era, knowing that Harry Potter will live on in the pages upon my shelf and the images on my DVDs. I would love to hear your Harry Potter memories. Or share your favorite book, movie, moment, etc. of the Harry Potter experience. If you have a Harry Potter related post be sure to link it at The Cait Files post so that everyone can read it. Great post Donna!! I agree the midnight book releases aren't very exciting but I did enjoy going to them for the atmosphere!! Totally agree that the friendship element is what makes HP so magical. I was always really upset b/c my boyfriend of 5 years HATED HP with a passion, but a year or so ago he changed his mind and we've watched and enjoyed and analysed all the films together and are going to see the new one on friday! Most of my friends LOVE HP and it's great to have that in common with people. I only read the first book in the Harry Potter series. When they came out I was in high school and far too interested in Kerouac and acid poetry to bother. Now I really feel as though I missed out and plan to read them soon! I had a HP marathon as well, with my friends, and we stayed up 'til 5am watching them all! I think your way of watching one a day is a lot more practical though. I agree that HP will always live in - I know that it's a series I can always go back to and will never get bored of :). My MOTHER actually read the books (at least the first three) before me. Since this is definitely not her genre, I knew I had to eventually take a look. I really enjoyed them, and the movies, and am sure I will be revisiting them with this last hurrah. My Best friend came to HP late as well after I cajoled her into finally reading one and she's been hooked ever since - way bigger a fan than I will ever be. I was also late to the Harry Potter party. I started when there were four books out and could not wait for the fifth book. I remember calling my friend as soon as I was done and saying "ok when's the next one coming out." To my horror--that was when she still had not set a release date. I started Harry Potter on October 10, 2010. I finished Deathly Hallows on December 11, 2010. I read the books first, then the movies. My big regret in life is not starting the series a little bit earlier. Nonetheless, I am still a HUGE fan of the series. Even though I hadn't started the series, Harry Potter was still there my whole life-literally-and I thank J. K. Rowling for all the amazing memories (Deathly Hallows Part 2 release on opening day) that I've made with Harry Potter, no matter how late I started the series. I will always love Harry Potter.